Angela Y. Dai is Counsel at Novick, Kim & Lee, PLLC, where her practice primarily focuses on trademark law, including domestic and international trademark procurement, strategic client counseling, due diligence, and opposition and cancellation proceedings before the U.S. PTO Trademark Trial & Appeal Board. She also counsels clients on copyright issues, and prepares and files copyright applications with the U.S. Copyright Office. 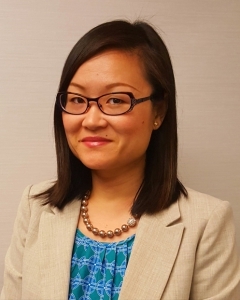 Prior to joining the firm, Ms. Dai was a senior associate at a top international law firm focusing her practice on patent litigation in the U.S. district courts, including Abbreviated New Drug Application (ANDA) litigation. Ms. Dai also prepared and negotiated settlement and licensing agreements between large pharmaceutical companies, and prosecuted patent applications before the U.S. Patent and Trademark Office in the biological and pharmaceutical fields. Ms. Dai has extensive experience handling legal matters for a wide variety of clients ranging from small businesses and startups to large international corporations. Ms. Dai speaks Chinese (Mandarin and Shanghainese dialects).